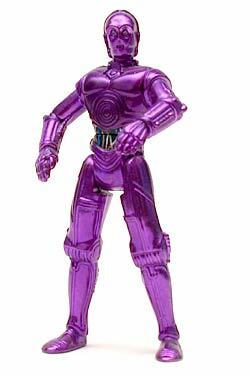 In the novel Crystal Star, C-3PO wears a coat of purple lacquer as a disguise. Purple is my favorite color so I couldn't resist. Also, it's a pretty simple repaint. I used acetone to take the gold tint off of the metallic surface, leaving it silver. Then I airbrushed purple glass paint over it. The glass paint is transparent, effectively glazing the silver metal underneath. That way it retains the original metallic sheen. I had to repaint the black on his midsection and all the wires because the acetone took it off as well.